I was comparing the Russia's Far Eastern zone with the equivalent Northeast China. Anyway the two regions have many difference but by comparing regions at the same latitude I found vast difference to exist in the population density. For example Primorsky Krai is federal subject with Vladivostok city being it's center and has a population of roughly 2 millions and an area of 165,900 km2 with population density 11.79/km2 while the adjacent Chinese province of Heilongjiang has over 38 millions, an area of 454,800 km2 and a population density of 84/km2. The population density is more than 7 times in the Chinese side. So, I would like to ask what reasons and conditions led to this situation. I am not familiar with the weather condition which may vary a lot between coastal and continental regions. I know that Russia annexed those regions relatively recently about 1858 but that does not answer the huge difference. Also, I am not familiar with recent population demographics which sometimes give a misleading figure. What was the population say 50 years ago for example, and how has changed since then. The last Chinese dynasty, the Qing Dynasty (1644-1912), was ruled by a minority called the Manchu people. 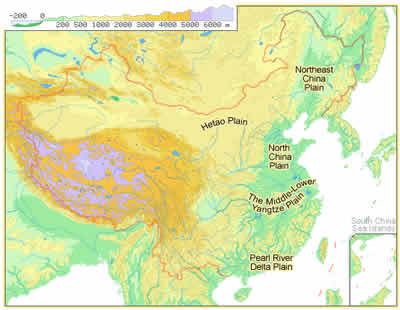 The were from northeast China, and limited population settlement there. Compared to the region south of Beijing, it was sparsely populated for this reason. In the late 1800s, Russia started to develop Harbin and other Cities in Northeast China as a colony. Economic problems in the non-colonial Chinese regions led to population growth in many colonial outposts, most notably Hong Kong and Shanghai, but also Qingdao, Shandong, Xiamen, Tianjin, and the Russian Cities in the Northeast. The fall of the Qing in 1912 ended regulations preventing migration to the Northeast, and accelerated economic decline, coupled with population growth, led to increased migration into foreign controlled zones. In the 1930s, Japan came to control Manchuria, and proceeded with economic development. By the time the communists founded the PRC in 1949, the Northeast had been under industrial development from first the Russians, then the Japanese. In 1949, it was the most industrially advanced region in China. When the PRC embraced the Soviet economic model, and received Soviet economic assistance and advisors, much of the industrial development also occurred in the northeast as it was close to the USSR, and it was already the most industrial part of the country. Many professionals and unskilled laborers from other parts of China moved to the Northeast for opportunities. This spurred enormous population growth in this part of China. Then, in the 1960s and 1970s, the CCP encouraged a high birth rate and the population of China just about doubled to a billion people. So the Northeast has a large population for two reasons 1) China has a ton of people in general and 2) there was (is) a lot of economic opportunity there. Let's compare this with Russia. Most economic development occurred near Moscow and Western Europe. Siberia was viewed as a place for prisoners and natural resource extraction. And Russia doesn't have the huge number of people that China has. Northeast China has more people because it is in China, and China has more people than Russia. Also, the Northeast had a lot of economic opportunities in the first decades of the PRC (1950-1990) because it was the location of economic development due to its location near Russia and the Japanese empire. Geography can largely explain the population difference. Northeast China (a.k.a. Manchuria) contains the Northeast China plain, China's largest at 350,000 square km. This area supports agriculture as well as population centres very well. During Japanese occupation, with the inclusion of Manchukuo, the Empire of Japan became the world's largest producer of many crops, including rice, wheat, maize, potato and cotton. Most of the territory is mountainous, and almost 80% of it is forested. Its agricultural sector is mostly around fishing. Despite this, for most of its history Manchuria was sparsely populated. It was occupied by various pastorialists, and was only settled by agricultural peoples in large numbers during the late Qing empire, as covered by axsvl77's answer. Not the answer you're looking for? Browse other questions tagged russia china or ask your own question. Why were Chinese divisions undersized?